I have quite a bit of information and pics from my recent meth install. Note that if you're not using the BMS meth kit, your mileage with this DIY may vary. You do this at your own risk. I am not responsible if you mess something up. Remove the 2 bolts in the back of the tank. Detach the bottom part of the tank from the top. Grab the tank fitting and put some thread sealant on the threads. Attach a 1 foot length of tubing to the tank fitting. Screw the tank fitting into the bottom of the upper tank. DO NOT OVER-TIGHTEN THIS! Feed that now attached 1 foot of line through the hole in the lower tank. Line everything up and reinstall the 2 bolts you removed earlier. While you have easy access to the pump, go ahead and turn the adjustment screw 3/4 of a turn. DON'T TURN IT ANY FURTHER THAN THIS. Now you will want to remove the inlet plug in the pump. Tip: To easily remove these plugs or the tubing later, simply push in on the plug, hold the plastic retainer in towards the pump and the plug should pull right out. Install the black quick-disconnect fitting into the pump inlet. Attach the 1 foot of line into the quick-disconnect fitting. I ended up wrapping the tubing around the pump 1 time. Now you can go ahead and attach the pump to the tank using 2 of the provided screws. That's it for the tank assembly. Through most of these pictures you'll see 2 wires attached to my methanol line. When I started this, I thought you needed to run both of those wires back to the pump. You don't. You only need to run 1 wire with the methanol line. Start by attaching 1 wire to your methanol line using whatever you want. I used tape. Remove the trim from the trunk. Now remove the last main trim piece on the side of the back seat and start running your line. You may need to attach the line at multiple points across your methanol tubing to keep the wires nice and neat. Keep running the line underneath your interior like this. Go ahead and remove the trim piece underneath the steering wheel. Now this next part is weird. You find this rubber grommet up towards the corner of the firewall. There is a top hole you'll want to stab a few times so that it can open up a bit. You can see where I jammed the flathead screwdriver in this pic. Look towards the driver side corner of the engine bay and you should see whatever you were poking through sticking out. Attach a clothes hanger or something to your line and run it through the hole you made making sure to keep the line under the interior. Now go ahead and detach the clothes hanger from the lining and pull your tubing and wire through so you have some length to work with. Detach your wire (again in the pic it shows 2 but you only need 1) from the methanol line. Make sure you have enough wire to comfortably reach over to the DME area. Leave some extra slack to make sure you have enough wire. Also go ahead and strip maybe 1/3 of an inch of the wire. Figure out where you want to put your inline filter. I put mine here towards the edge of the engine bay. Snip your methanol tubing to the appropriate length. I wasn't sure exactly what threads needed thread sealant so I just put thread sealant on EVERYTHING that had threads. If that's wrong, someone let me know. So put thread sealant on each of the threads on the inline filter. Make sure your filter is pointing the right way. There is an arrow on it that points with the direction of flow. Insert the methanol tubing coming from the firewall into the filter inlet and tighten it down. Don't over tighten this. Now run the free tubing through the little rubber grommet and into the filter outlet. This can be seen 2 pictures down when I talk about the solenoid. Tighten the tubing in the filter outlet. 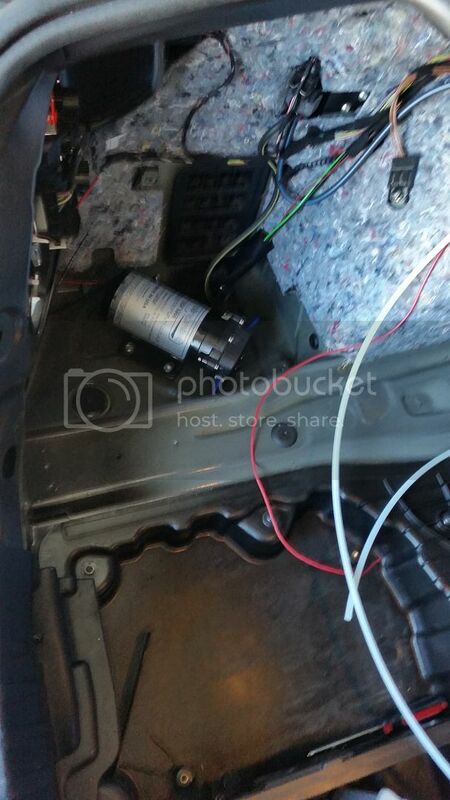 Now attach the solenoid like this. Not much to explain here. Just run the 2 black wires under the rubber grommet with the methanol tubing. Hook up your methanol tubing then use cable ties to attach the lines to the black cable that runs behind it. Congratulations your lines are now run. All that's left is to wire up the FSB, conceal the lines, and put everything back together. Access your DME / JB4 bay. At this point you should know how to do this. Disconnect the Amp connector from the JB4. You may need to unscrew the Amp connector from the JB4 box. I used the top of the DME box as a container while I did all of this. Be careful not to drop any screws. If you drop any screws, you're gonna have a bad time. Remove the 2 screws and nuts holding the Amp connector together. Set those to the side along with the 2 screws that attach the Amp connector to the JB4. Refer to the official install guide to determine which wire goes where depending on your engine type. Since I have an N54, orange goes to spot 2 and blue goes to spot 15. For N55 vehicles, use spots 3 and 16. There are reference numbers on the Amp connector if you get confused. Try to run your wires underneath the black cable shield. I forgot to do this and needed to cut open the black shield so the wires would be protected. Now reassemble your Amp connector. Place the 2 halves together and put the screws that attach to the JB4 box in first. Then attach the remaining 2 screws to the nuts. Now run your black ground wire to the shock tower. I didn't get a pic of this so I've borrowed one from the BMS install guide. Now to connect the FSB to power. Remove the orange wire from the red JB4 power wire. plug the FSB into the now open JB4 power wire slot. Plug the orange power wire into the open slot in the red FSB wire. I didn't like the included fuse holder so I went to Advanced Auto and picked up a nicer one. Using a crimp connector, attach the fuse holder to the raw ended thick red wire. Don't forget to install the included fuse. Get a crimp connector and crimp the wire with the fuse holder attached to one side of the crimp connector. Now you will want to grab the included raw red wire (the plain wire that came by itself). Strip off the end of it. On the other side of the crimp connector, you will insert the red wire that you just stripped and the wire that you ran with your methanol tubing. With both of those inserted into the crimp connector, crimp it. Make sure these connections are nice and solid. It should look something like this except you will have 2 wires going towards the DME. In this image I ran the wires together over by the driver's side. However you do it shouldn't really matter so long as both of those wires end up connected to the fused wire. Now just use another bit of wire to connect the remaining solenoid wire to the green FSB wire. Conceal the wires underneath one of the 3 grommets and package everything up nice and neat. This is what my setup looks like. I just used some cable ties to secure the wires. Now go ahead and start planning how you will arrange your tubing to the trunk. Where your line will come out of, how much cable you want exposed, etc. 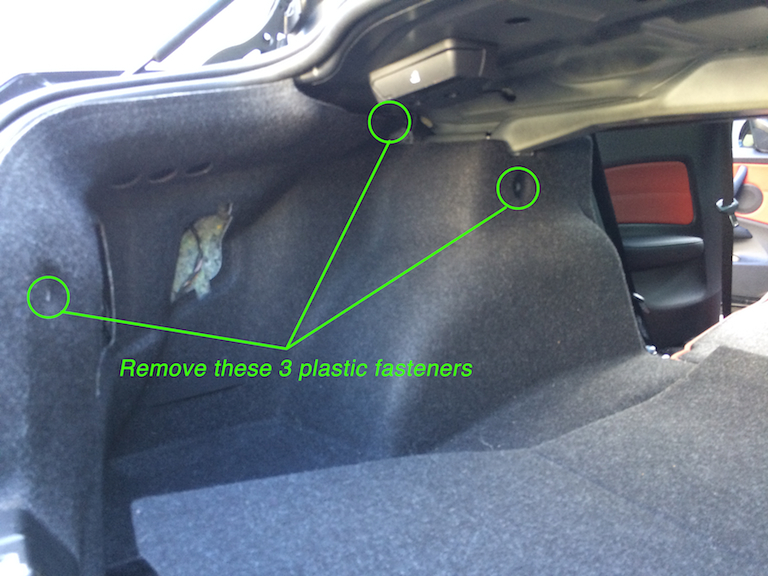 Get your trunk interior put back together with your lines run. Connect the line you ran with the methanol tube to the red wire on the pump. 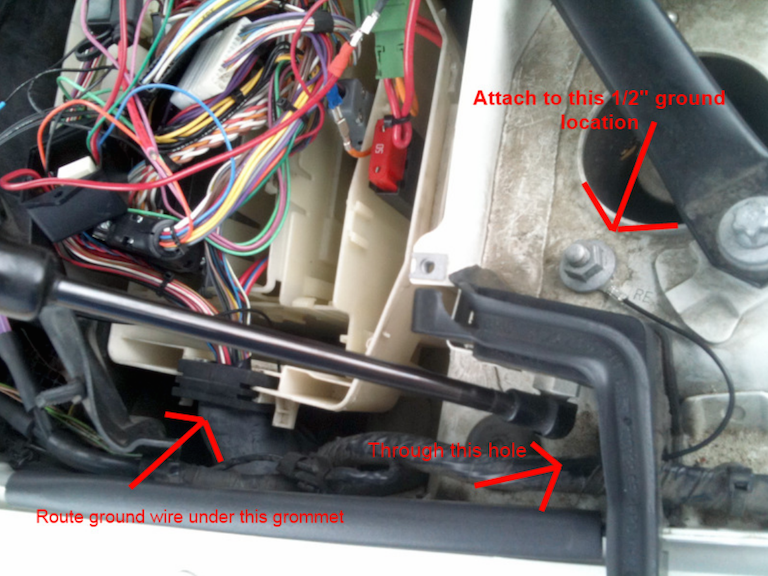 Grab another length of wire and connect the pump's black ground wire to the battery ground in the trunk. This is what my installed tank looks like. Your pump's red wire is connected to the big red FSB wire. Your pump's ground wire is connected to a solid ground point. 1 solenoid black wire connected to big red FSB wire. 1 solenoid black wire connected to green FSB wire. 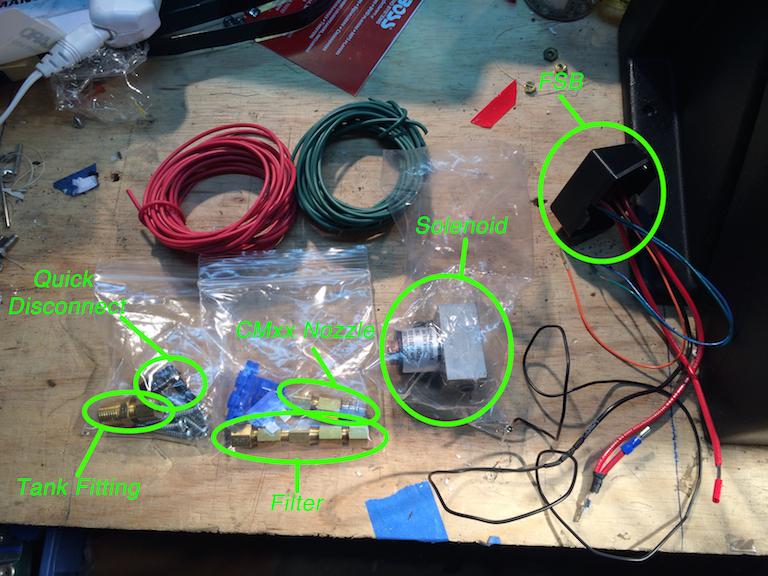 Now stick some tubing into the solenoid outlet and lets test it out. Insert the fob into the ignition, and press the start button (don't turn the engine on). Activate the JB4 command mode (both down buttons on the steering wheel). Go to 7-5. Make sure your line coming out of the solenoid isn't going into the engine bay. Press and hold the gas pedal in for 10-15 seconds to get the initial air out of the line. Check for leaks at any of the connecting points and look for air bubbles going into the pump. If you're all good, go ahead and connect your CM nozzle to the solenoid outlet. Using a JB4 app, set Meth Scale to 60, Meth Add to 40, and Start Meth Flow at around 11.0 (this value simply tells the JB4 when to start spraying meth). Now with the nozzle connected, but not inserted into the chargepipe, we can test the flow of the meth system. Again go into 7-5 and press the gas pedal ensuring the spray is going in a safe direction. Your oil gauge should be maxed out after a second or so. If it's not, did you turn the pump adjustment screw 3/4 of a turn earlier? If you already adjusted the screw, have ensured you have fluid in your meth tank, and the nozzle is attached, and still aren't getting 100% flow, then hit up someone at BMS for support. That's it. If you're getting 100% meth flow, go ahead and install your nozzle into the chargepipe and start logging/adjusting. Alright I got tired of seeing that big tank in the middle of my trunk so I decided to make a new mount and save some space. This mount just uses 2 L shaped pieces of metal and a third piece that looks kind of like a J. All I need to do now is paint the brackets. 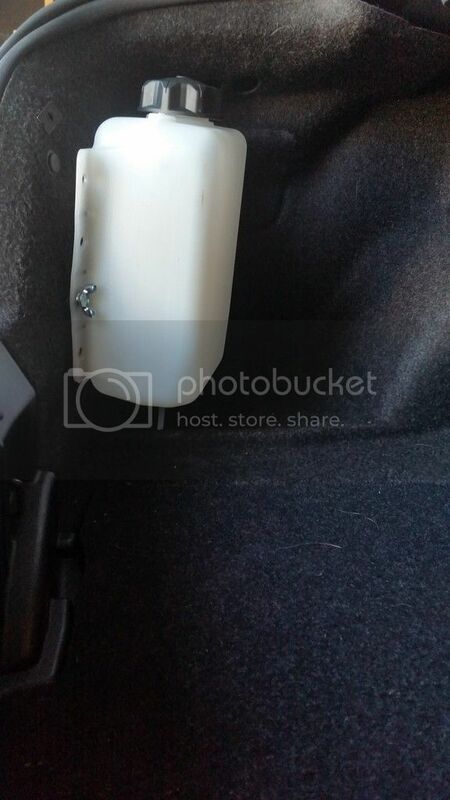 Last edited by Dmac @ BMS/DMD; 03-01-2018 at 01:22 PM..
Are you planning to do anything about the exposed cables in the trunk? Thanks for the instructions, great photo's, and annotations, very professional. Updated post with new mounting location. What diameter wire loom tubing did you use? Awesome thanks! I bought 10 feet of 1/2 inch but I'll probably pick this up and save the other for later. just behind the back left wheel i found this nice little space. 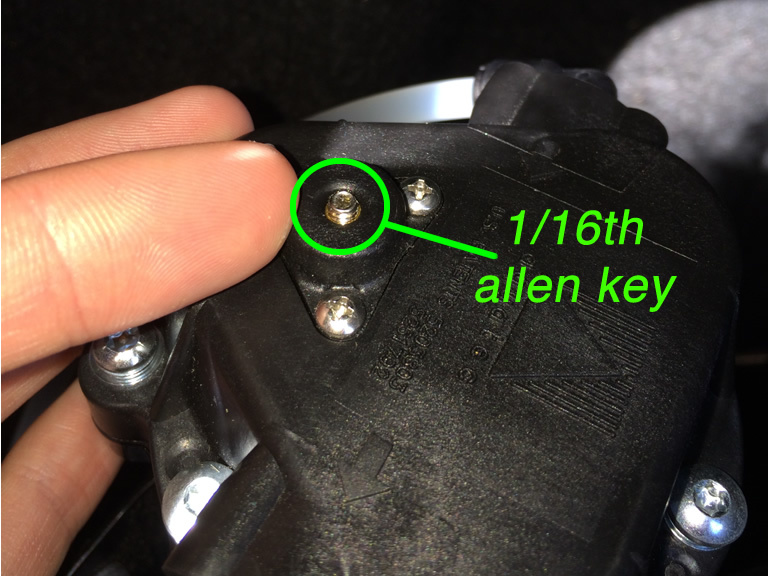 Quick question: when you said to turn the 1/16" Allen key on top of the pump 3/4 of a turn, did you mean clockwise or counter clockwise? 12.7@115mph, 2.1 60' on Toyo All Seasons. Boost limited to 12psi in second, 19 in 3rd & 4th. Clockwise if I remember correctly. great write up. Nice ! please forgive my ignorance but what does this adjustment screw do? Increase flow rate? Mine pumps like this, but I didn't adjust the screw on the pump. Should I remove the pump and adjust it? Just check the flow in a log with the nozzle attached to see if you need to adjust it. Or just adjust it now and don't worry about it. I didn't adjust during the initial install either but went back and turned it. I was surprised that it wasn't listed in the BMS install guide. How would you know where the screw should be and what does it do? Something to do with pressure from what I've seen. What is the impact of not adjusting it? I assume it is pressure related but I'm not sure. Meth was flowing at 90 before adjusting it and 100 after. The screw is on top of the pump and is exposed. Why would you not adjust it? Well it wasn't in the manual so I didn't adjust it but I was helped with the install. Now it's installed so I'd have to take it out to adjust but my meth flow is reading 100% anyway so I guess it's good and I can leave it. I wouldn't think the pump would be installed in a hard to reach location. I had to unscrew mine from the back of the tank and adjust it. Took me all of about 5 minutes. Just make sure you have the correct size allen wrench before you get to your pump. Here is an idea for how the tank can look with a little care in the back of a 335i. I welded up my own bracket to tuck it in and there are two bolts that now come through the trunk liner that it fits on so it can be removed with no visible marks (those tiny holes disappear pretty easily). I use butterfly nuts to hold it on the bolts so it is easy to pull out for pump service if needed. The carpet is the same that you would use on a speaker box. so i connect the black wire selenoid to the red wire fsb and on the green wire on the fsb? what about the red wire on the pump? so the black wire selenoid is should be wired togheter with the red fsb and red pump??? and the black pump wire on a grounded erea ? ?so the black pump wire has no funktion just needs to be grounded?? the jb4 amp db25, when i connect the wired i have to use #16, #3, right?, well then i have to remove the pins becuse it would be occupied right? the orginal pins #16, #3? so were do i put the original i dont get it...or am i getting it all wrong? and when it comes to the ewg wires is it the same i dont realy get those i just need to be enlighted becuse im new to these kind of stuf and i learn quickly but i dnt understand really what to do with the wires the original and the new ones or if there is empty spots i know the, i know there is emty spots but what do i do with them??? Last edited by Alano_Mpower; 04-12-2016 at 02:03 PM..
Did you go to the BMS website and reference the install guide? Usually if they tell you to put a wire in a certain pin slot and it's already occupied by the another wire, then they want you to remove it and put the wire in place of it because it needs that communication line for the system to work properly. Just make sure you follow the direction and are putting the wire in the right pin slot for your model per the BMS instruction and all should be fine. bump, the pictures are all down. trying go install bms kit, anyways to recover pictures?